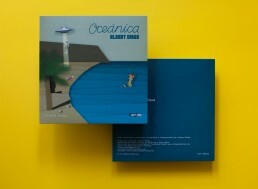 “Oceánica” is the Albert Ginés first 7″ EP. His music is inspired by the early surf music. His song “Oceánica” has a exotic style that took me to design a digital illustration of a beach. But strange things happens on this tropical picture, as well as the music of Albert, that introduce different instruments and unconnected sounds to his compositions, I got unusual images into the cover to make a digital collage.